In the spirit of selfless community service, Ms. Benita Diana Martin has been selected to receive this year’s award. Benita was born in Detroit, MI (1952), though has long been proud to call the Virgin Islands her home. Benita gave birth to five children — Ayinde, Naima, Ariel, Amad, and Lukata — while providing a mother’s love to numerous youth throughout the world. Benita’s professional career began in 1979 after graduating with a master’s degree in Blind Rehabilitation. She has provided orientation and mobility (travel skills) Braille and vision training and other vision services to blind and visually impaired children and adults throughout the United States, Kuwait, Egypt, and in 1994 with the Virgin Islands Department of Education. Benita continues to provide services to various organizations to address issues of person with a disability in the Virgin Islands including VI Find, Center for Independent Living, and the VI Special Olympic – St. Thomas. 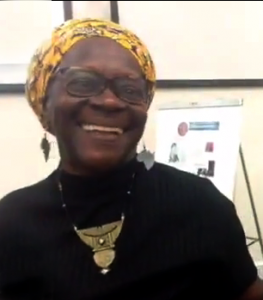 Over the past twenty years Benita helped keep vital elements of local culture alive, collectively working with a number of organizations that promote, preserve, and defend the future and ability of Virgin Islanders to practice self-determination, and to foster the most basic forms of healthy life and living. Some of those culturally-based organizations include the Pan-African Support Group, Afrikan Liberation Day, Rastafari Improvement Association, Kwanzaa 365, Sankofa Saturdays, Per Ankh, Inc., Queens of the Earth, and the African Diaspora Youth Development Foundation. She has also provided eight years of service to the Dollar for Dollar Coal Carrying Annual Commemoration and ten years to The St. John African Slave Revolution Annual Commemoration. Benita’s tireless efforts to help preserve the land and sea of our delicate islands include work with the Environmental Rangers, Environmental Association of St. Thomas (EAST), Virgin Islands Recycle Partnership (VIRP), Waste Management Authority (WMA) Community Advisor Board, Camp Umoja Academy, and the Virgin Islands Conservation Society (VICS). Benita began her studies in alternative organic system farm practice in 1978. After becoming a vegetarian, she realized that we must grow what we eat and educate our community on how the current fast food system generates too many health issues. In 1995 she began to put her knowledge of organic farming into practice at Green Thumb Farm (GTF) in the St. Thomas Bordeaux area, building a fully operational 20×80 greenhouse, and assisting with all aspects of the farm, making it one of the most productive sustainable organic farms on the island. Benita joined We Grow Food Inc., noting the importance of providing food for their community. She has since served as a board member and is currently co-chairperson of the Future Development Committee. Benita has greatly aided in the development of projects/activities for the advancement of agriculture in the Virgin Islands to include: Land Agreement between Livestock Association and Bordeaux Crop Farmers Source. In short, Benita is a caretaker of mother earth, continually involved in projects contributing to improved conditions and resources critical to healthy on-island farming practices. She is a vital member of the Bordeaux Farmers Annual Agriculture and Cultural Fair and the Bordeaux Farmer’s Market, as well as, the 1998, 2004, and 2005 Agriculture & Culture Summer Camp. Benita has worked with many agriculture organizations and educational programs with goals to promote, develop, preserve and defend agriculture in the Virgin Islands. They include Farmers In Action, Southeastern African American Farmers Organic Network – Caribbean Initiative, Virgin Islands Farmers’ Cooperative, Islands Food Security Inc. (The Network), Emerald Thumb Garden and the Gladys Abraham; Ulla F. Muller; and Lockhart elementary school’s garden clubs.